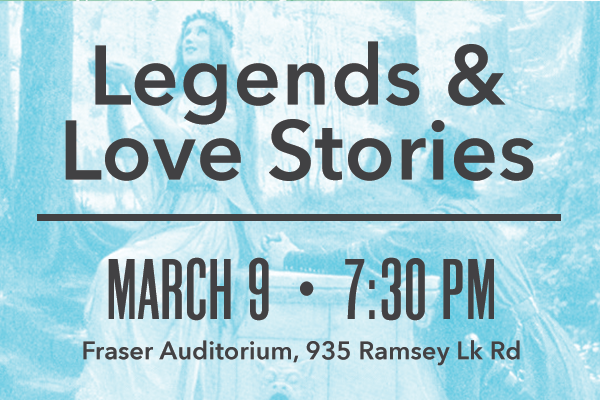 From forbidden love to the myth of Prometheus, the SSO performs music inspired by romance that speaks of enriched stories. We open with Sibelius’ doomed love epic, “Pelléas and Mélisande”, followed by Beethoven’s “Prometheus Overture”, inspired by a tragic myth. We delve into Schubert’s dreamy and melancholic “Unfinished Symphony”, along with Glenn Buhr’s slowly evolving melody, inspired by the culture of India, “Akasha” (the Sanskrit word for space or sky). Glenn Buhr, born in Winnipeg in December 1954, is a Canadian composer, pianist, and conductor. After studying composition at the University of Manitoba, British Columbia, and Michigan, he debuted his doctoral thesis composition – the symphonic poem Beren and Luthien (based on Tolkien’s mythic tale) – with the Toronto Symphony in 1985, winning a SOCAN award. Buhr has been composer-in-residence for the Winnipeg Symphony Orchestra, director of new music at the Kitchener-Waterloo Symphony Orchestra, as well as a teacher and university research chair at Wilfrid Laurier University. Outside of classical music, Buhr is a jazz pianist with the Glenn Buhr Quartet. Buhr’s music is often programmatic, inspired by writers such as Tolkien and Joyce, and often follows the Romantic Period stylings. Akasha was commissioned for a concert celebrating the 25th anniversary of the CBC National Radio Competition for Young Performers. Akasha, Sanskrit for space or aether, means “sky” in many modern Indo-Aryan languages. The piece, led by the slow melody in the brass and a shimmering overlay from the winds, leaves the listener feeling a sense of spaciousness and calm. Jean Sibelius (December 8, 1865 – September 20, 1957), was a Finnish composer and violist of the late Romantic and early modern periods. Considered by many to be Finland’s greatest composer, he is credited with helping the country develop its own national identity during the struggle for independence against Russia. Pelleas and Melisande is a play symbolic written by Maurice Maeterlinck in 1892 about a forbidden love between the two title characters. Married to Pelleas’ brother Golaud, Melisande and Pelleas fall in love, are soon discovered, and Pelleas is killed. Melisande then dies giving birth. Before Sibelius wrote his incidental music for the play, Claude Debussy adapted it into an opera, Arnold Schoenberg wrote a symphonic poem, and Gabriel Faure also wrote incidental music for the play’s performance in London. Called a “soundtrack” when applied to movies, incidental music is background music that is intended to add atmosphere to the otherwise non-musical play or film. Composed in 1801, this piece opens the only full-length ballet ever written by Beethoven. Born in December of 1770, Ludwig van Beethoven was a German composer who was an integral figure in the transition between the Classical Era and the Romantic Era. He remains one of the most recognized and influential composers of all time, with many of his works performed each year by orchestras throughout the world. After moving to Vienna (where he stayed for the remainder of his life) in 1791 at the age of 21, he continued his studies under Joseph Haydn and gained himself a reputation as a virtuoso pianist. After Haydn left for England in 1794, Beethoven chose to remain in Vienna even though his annual stipend from his home city of Bonn was stopped around the same period. Fortunately, his talent on the piano garnered him some patrons, including Prince Joseph Lobkowitz to whom he dedicated his first works (the three piano trios), as well as his first six string quartets. Written just after his first symphony and around the same time as his famous Moonlight Sonata, this ballet is one of his first large-scale orchestral works. The ballet is about the ancient legend of Prometheus – a figure who brought enlightenment to his people by leading them to Parnassus and the god Apollo. Napoleon, who at this time was still seen as a hero to the people, was believed to be a Promethean-type figure, which likely influenced Beethoven in his writing of this ballet. The overture itself begins with characteristic Beethoven tension before moving into a more lyrical introduction. Two themes are then presented: the first filled with energy, and the second more delicate, led by a duet in the flutes. Despite living for another six years, Frank Schubert left this Symphony unfinished. Only two movements were completed, with a third scherzo movement partially completed. Nobody is sure why he never finished this Symphony, though some have speculated that he simply became distracted with another work for solo piano, and others that he associated the writing of this work with his initial outbreak of syphilis and therefore didn’t want to finish it. Written in 1822 for the Graz Music Society, Schubert gave the unfinished manuscript to Anselm Huttenbrenner, a friend and member of the Society. For reasons unknown, Huttenbrenner kept the manuscript hidden until 1865, when it was finally performed in Vienna. Franz Schubert (1797-1828), was an Austrian composer who, like Beethoven, bridged the transition between the Classical and Romantic periods. Despite only living to the age of 31, he wrote many famous works still performed today including the Trout Quintet and this Unfinished Symphony. Buried next to Beethoven in a cemetery in Vienna, Schubert may have died of typhoid fever, mercury poisoning, or the late stages of syphilis. The first movement of the Symphony, the Allegro moderato, is in sonata form. Instead of starting with the energy that many earlier symphonies did, this one opens with a ghostly melody, starting softly with the strings, and then followed by the first theme shared by oboe and clarinet. The second beautiful and lyrical theme is then brought in by the cellos, followed by the violins. Both themes are then explored before finally resolving back to the home key of B Minor. The second movement, an Andante con moto, echoes the first movement, bringing a sense of unity to the overall piece.